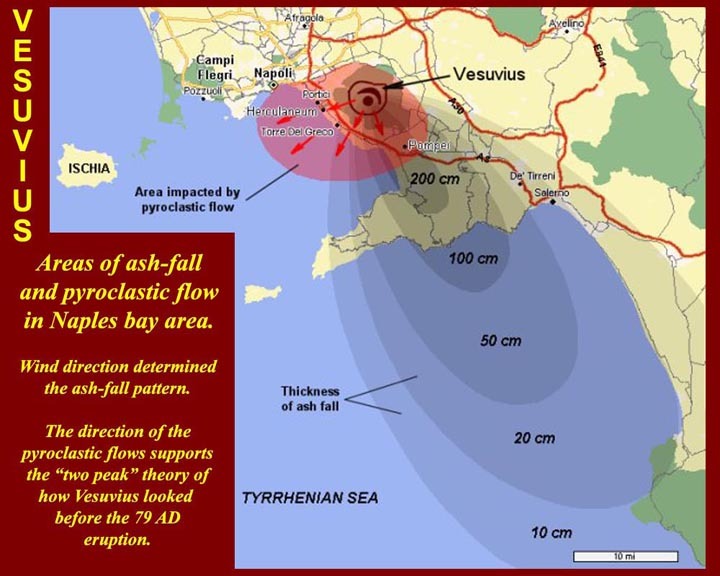 The 79 AD eruption of Vesuvius washed over the Bay of Naples, and, according to Pliny the Younger, the cloud of dust and debris associated with the climactic pyroclastic flow reached Misenum at the far western end of the Gulf of Puteoli (Pozzuoli). 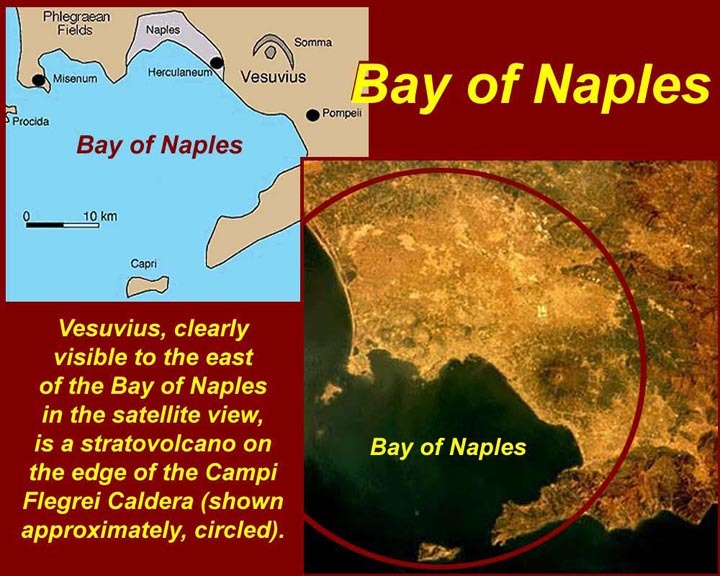 The ancient Romans called the Bay of Naples the "Crater", by which they meant that it was shaped like a bowl. Actually, the bay and the Campi Flegrei to the north are both just parts of a single large volcanic caldera. 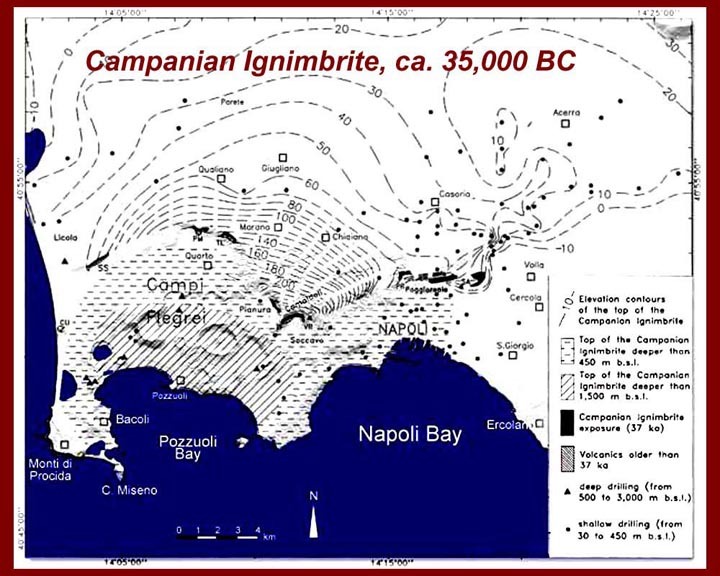 Inside the northern edge of the Bay of Naples Caldera is a smaller Caldera called the Campi Flegrei, which was formed about 37,000 years ago: a huge eruption deposited the "Campanian Ignimbrite", and the Campi Flegrei caldera came into being when the magma chamber collapsed. Another major cycle of eruptions ended 12000 years ago with the deposition of the "Neapolitan Yellow Tuff" and additional magma chamber collapse. 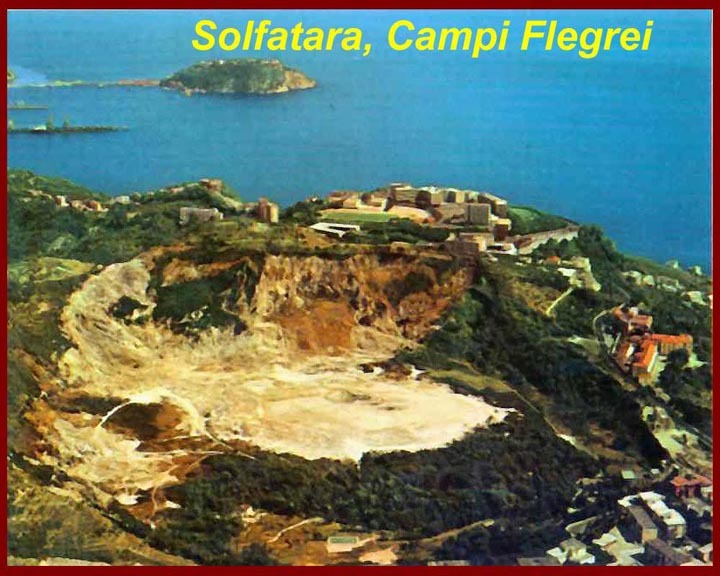 Since that time there have been numerous smaller eruptions from more than 60 "volcanic centers" in the Campi Flegrei. All this activity has caused an extremely jumbled volcanic field with numerous large and small craters and fissures. Vergil, in his Aenead, sets the visit of Aeneas to the Underworld in the Campi Flegrei where one of the volcanic craters, Lacus Avernus, was well known as an entrance to Hades. 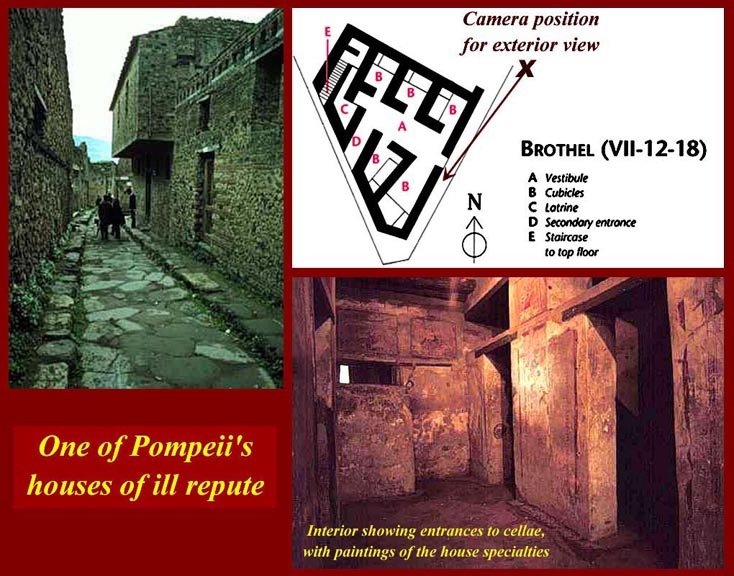 Various locations in the Campi Flegrei are easily identified in Vergil's text, but there were centuries-long debates about where other features might be. 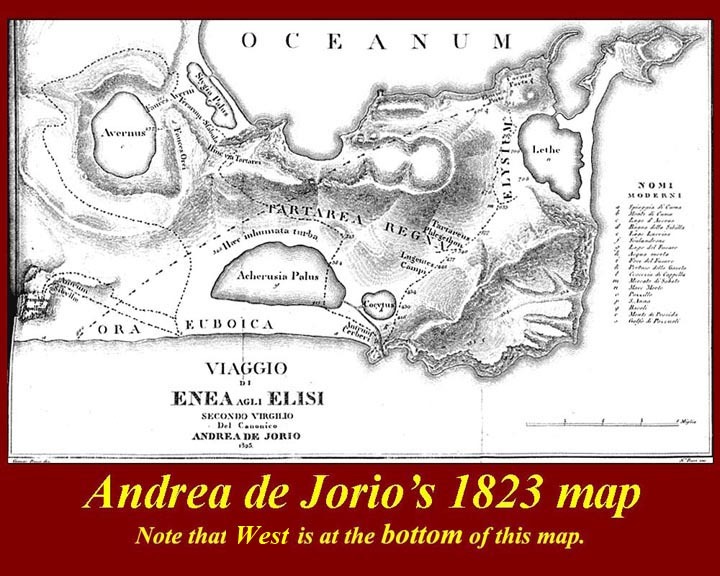 In 1823, Andrea de Jorio wrote what he thought was a definitive study of where all Vergil's locations were -- and he included this map. Note that North is on the bottom of the map. 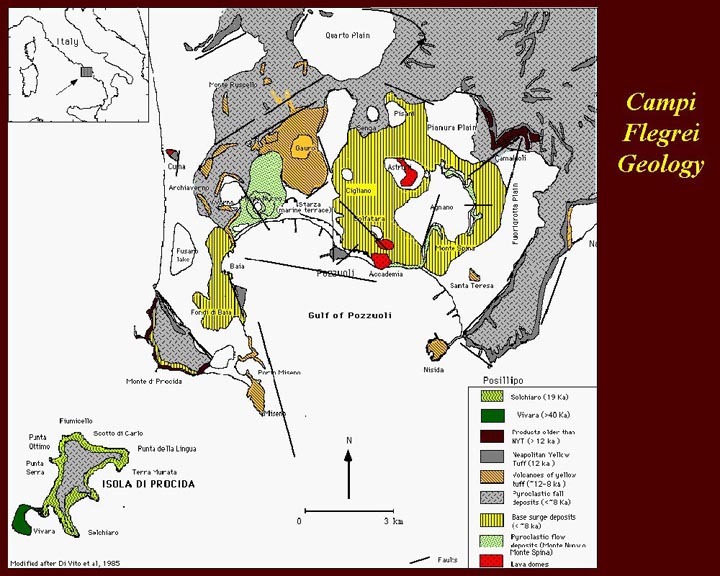 A map of the complex geology of the Campi Flegrei. Solfatara has been, since ancient Roman times, a health resort where sulfurous fumes and waters are said to cure a variety of pulmonary and gastric ills. It is also one of the hot spots in the Campi Flegrei -- boiling mud, steam vents, occasional sulfur lava. One side of the crater is much hotter than the other: it's important to stay on the wooden pathways to avoid sinking though the thin crust. 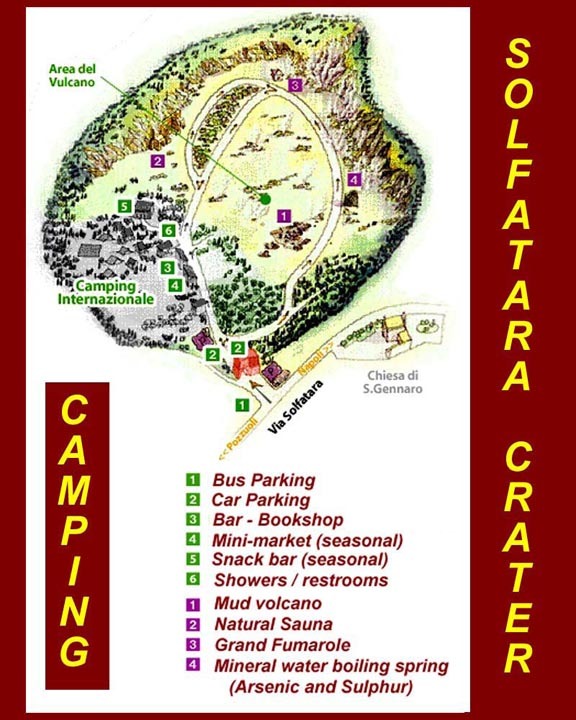 According to local legend, as long as Solfatara boils there will be no eruption of Vesuvius. 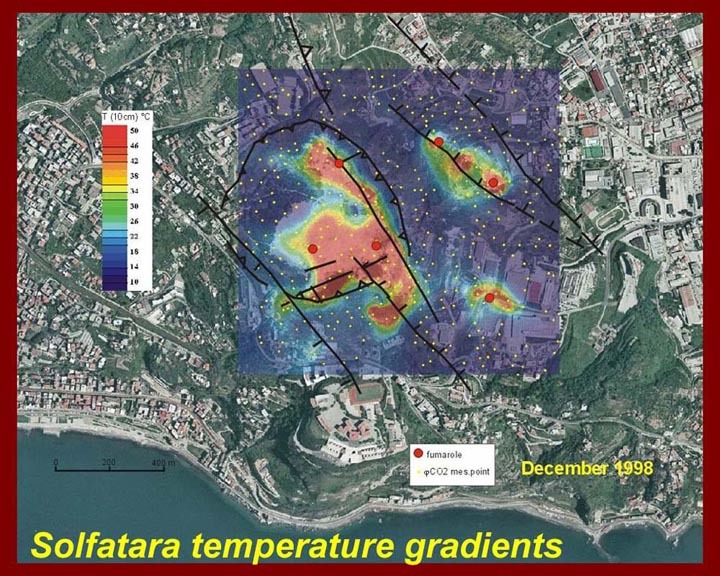 The image shows temperature gradients inside the Solfatara crater in december of 1998. Such readings are taken at least monthly and much more often when surface movement (rising or falling) is detected. The side of the crater that is cooler and less active is a tourist camp. The church of St. Januarius (San Genaro) is just outside the crater. Neapolitans pray to Januarius for protection against Vesuvius. Local lore speaks of Januarius being beheaded on the rim of Solfatara. The martyr's head tumbled down to where the church now stands, singing and praying until it stopped rolling. On the feast of San Genaro, a vial of his blood is displayed in the Naples Duomo, and it miraculously liquefies thus reassuring Neapolitans that Vesuvius will stay quiet for another year. Admiral Pliny, the Elder, watched over his military fleet in the natural double harbor from a villa on the slope of Cap Miseno at the western end of the Gulf of Puteoli. 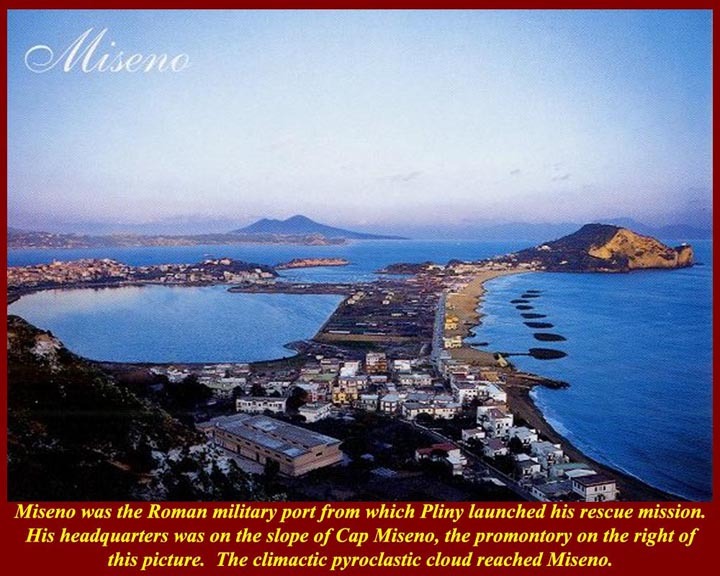 Before launching the fleet on his fatal rescue mission in 79 AD, he climbed to the top of Capo Miseno for a better view of the eruption. 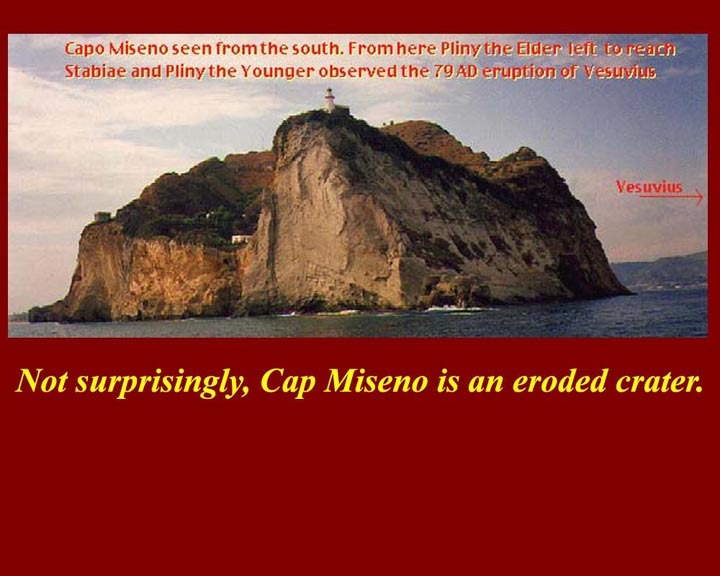 The small eroded crater that is Capo Miseno is a natural fortress, but it was too far away from the cities around the Bay of Naples to launch effective protective missions -- either from Vesuvius, or, later, from lightning raids by barbarian pirates. 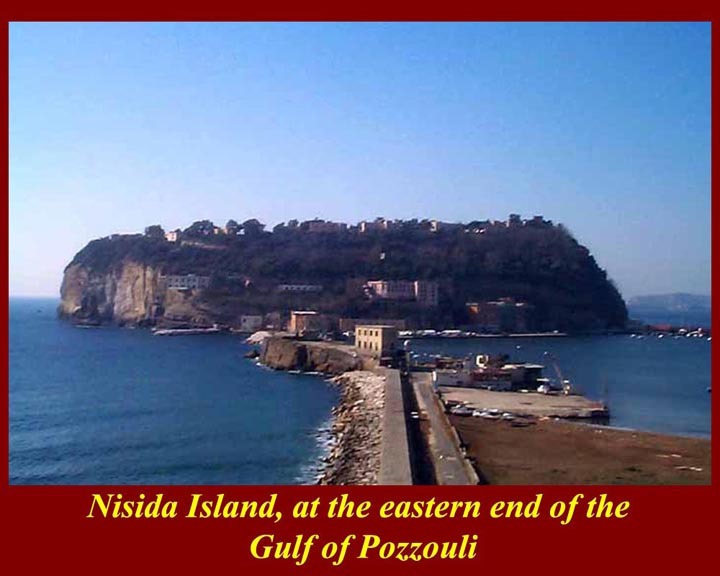 Guarding the eastern end of the Gulf of Puteoli is the fortress island of Nisida. The Naples port is today the major entrepot on the Bay of Naples, but in ancient Roman times Puteoli was the big port. It survived the 79 AD eruption and quickly was back in business. 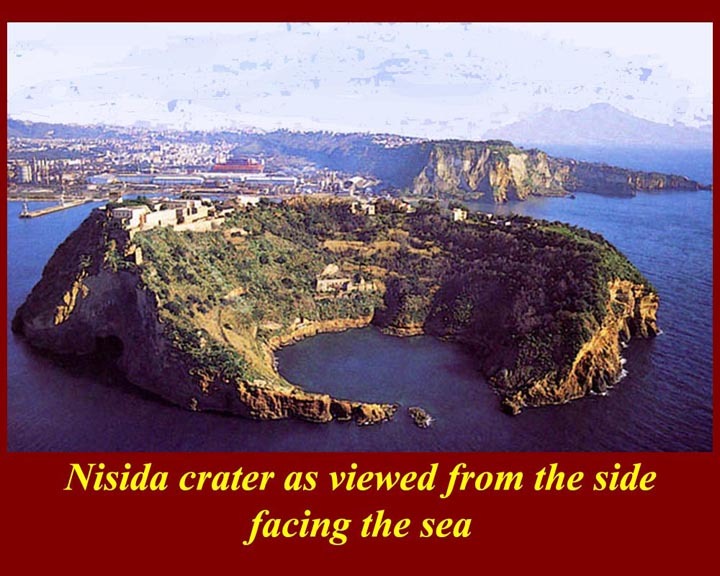 Nisida is also, obviously, an eroded crater. The view from the sea side. 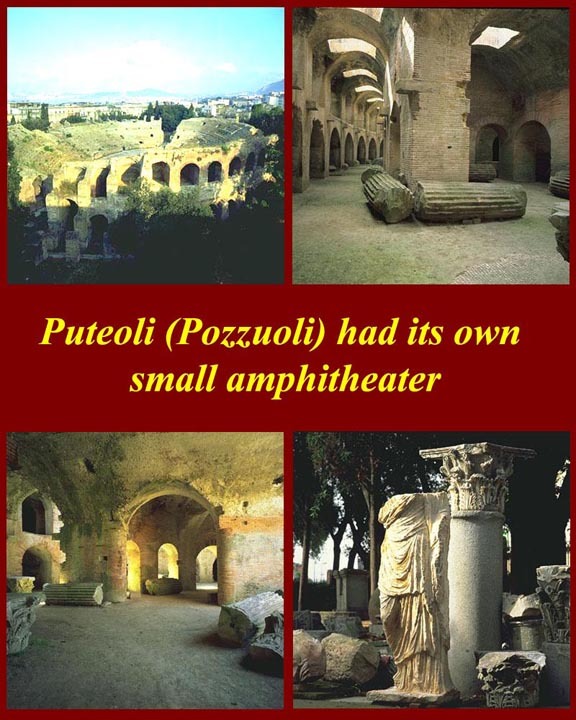 Puteoli was big enough to have its own amphitheater -- in fact, two of them. This one, the larger, was built by Domitian, the younger brother of Titus, who was emperor when Vesuvius erupted in 79 AD. It seated about 40,000 and thus was twice as large as the on in Pompeii. 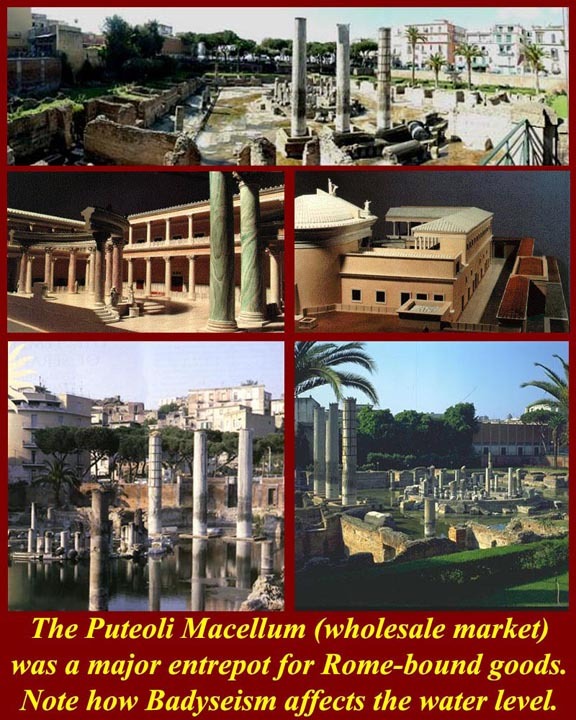 Puteoli also had a theater and a circus (chariot race course). 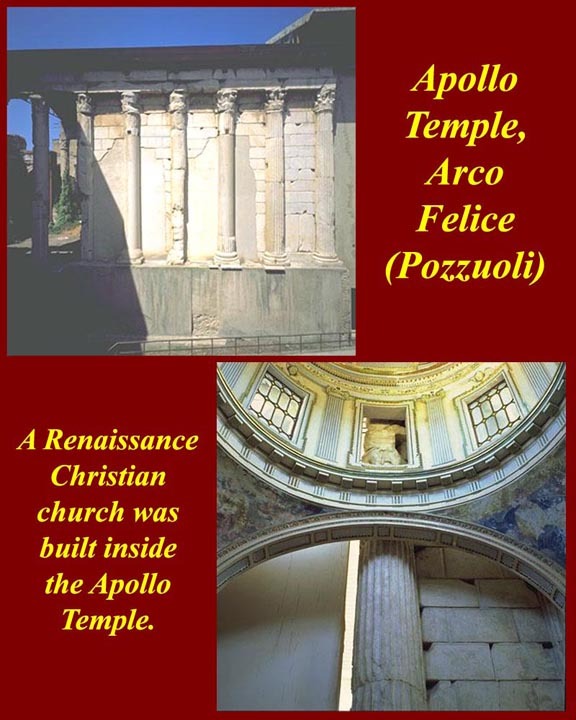 Puteoli's Apollo Temple was converted to a Christian church during the Renaissance. The town name Puteoli is derived from a Greek word meaning "sulfur springs". Puteoli's hot sulfur baths were and are famous throughout Europe as curative spas. 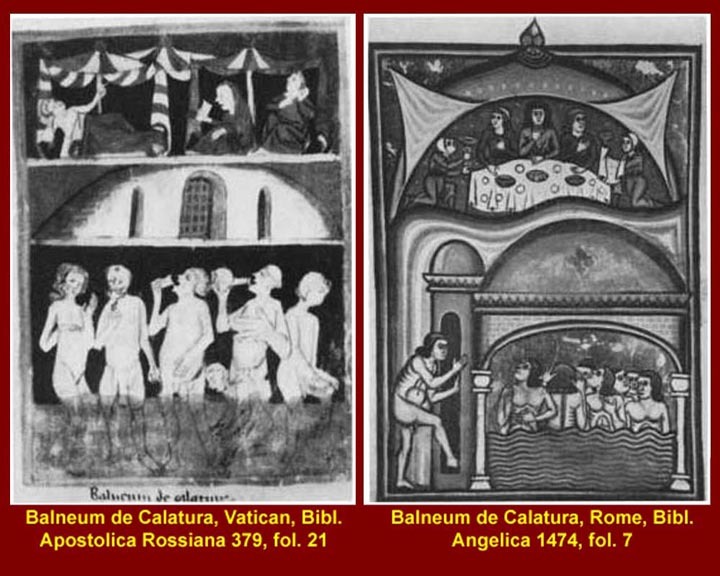 The images are illustrations from a Medieval advertising brochure for Puteoli's services, pages of which are in two Vatican libraries. Bay waters due to "inflations" of the 1970s and 1980s. Lacus Avernus (Lago d'Averno) is in one of the defunct craters of the Campi Flegrei. 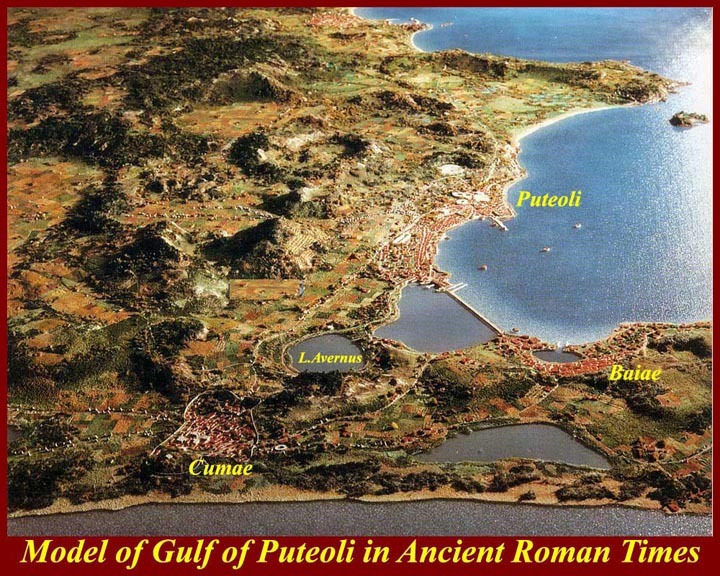 in ancient times it was connected by canals to the Baiae Bay, a small feature of the Gulf of Puteoli, right side of the picture. 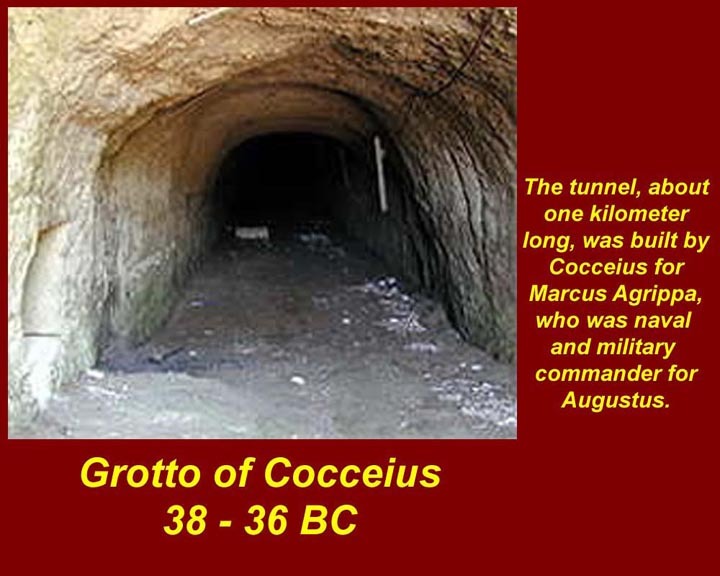 During the time of Augustus, Marcus Agrippa had a tunnel dug from Lacus Avernus to the old Greek colony of Cumae on the Mediterranean (top) by his great tunnel engineer Cocceius. The Lago d'Averno end of the Grotto of Cocceius. The other end connected with pre existing tunnels under the acropolis of Cumae (one of which has been identified as the cave of the Cumaean Sibyl.) 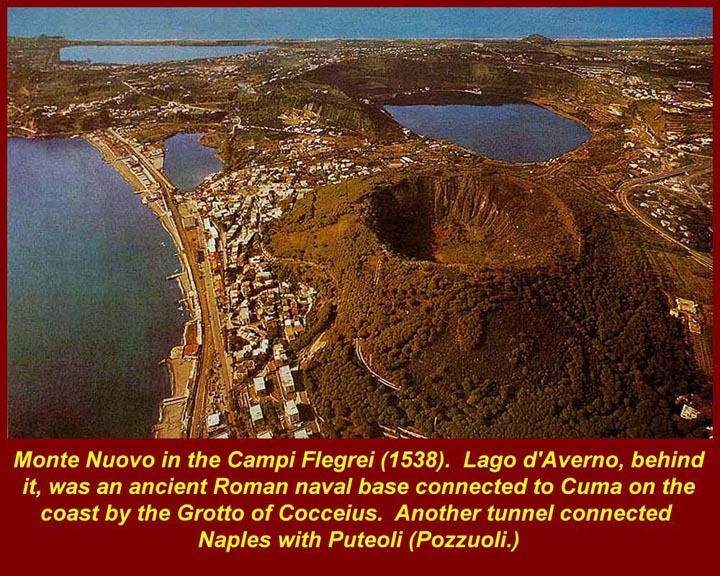 Cocceius also built another tunnel for Agrippa connecting Puteoli with Naples. Both tunnels were damaged during W.W.II, and they are no longer open to tourists. 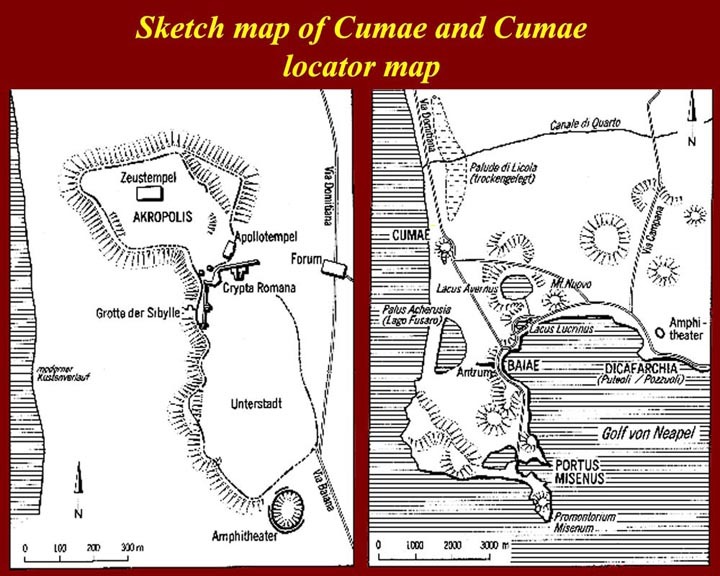 Maps of Cumae and the Procida Peninsula. 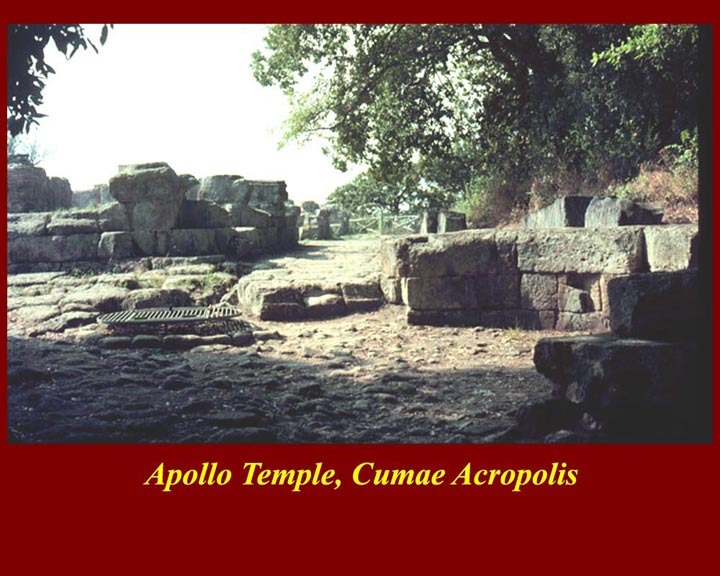 Cumae had an upper level (acropolis) on a tufa hill and a lower residential area. The acropolis hill was honeycombed with tunnels, which probably were originally quarries but later became storage areas and, in some cases, acquired religious significance. 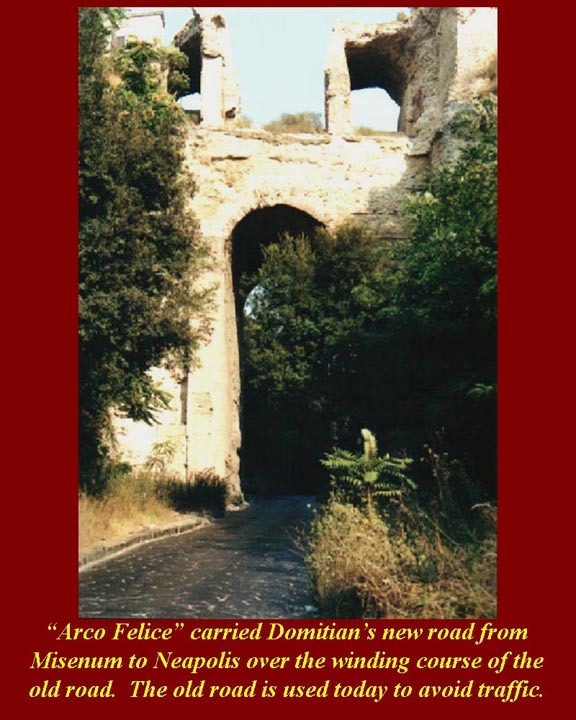 The Arcus Felix (Arco Felice) carried Domitian's new straighter road from Misenum to Neapolis over the old winding road. Domitian's road has fallen from the arch, and the ancient road below is used by knowledgeable locals to avoid superhighway traffic. Domitian, who took over the imperial throne when his older brother Titus died in 81 AD undertook major rebuilding projects in the Naples Bay area, but made no effort to revive the Port of Pompeii, which, after the 79 AD eruption, was 1500 meters from the new shoreline. A model of the Campi Flegrei as the area looked at the time of the 79 AD eruption. 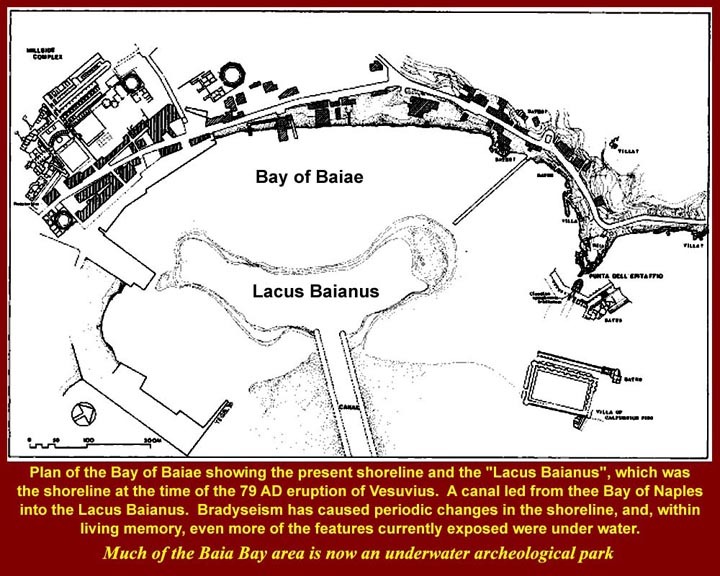 The harbor between Lacus Avernus and the Baiae Bay is now dry having been uplifted ("inflated") over the centuries. In front of Baiae was Portus Julius, the early imperial navy port that had already been abandoned by the time of the 79 AD eruption, because it was too shallow to take large new Roman warships. 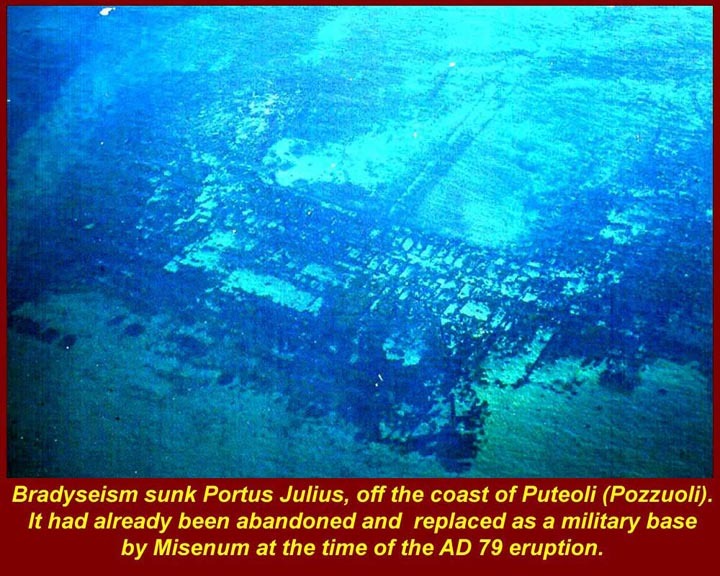 Another image, below, will show the remains of Portus Julius. 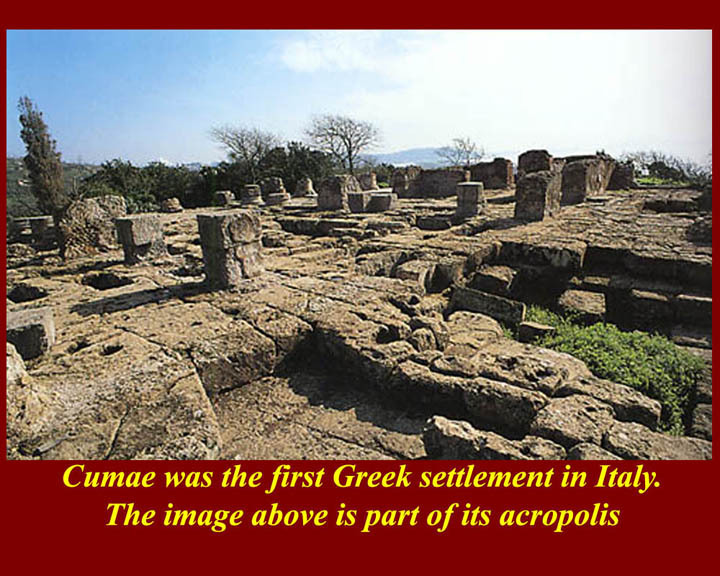 The acropolis of Cumae started as a hilltop fortress of colonizing Greeks -- it was the first Greek colony on the Italian mainland. As the town grew in size and power, it spread southward into lower-lying fields, and the Acropolis gradually became the abode of religious and administrative functions of the colony. Although it eventually came under Roman sway, it, like Neapolis, kept its "Greek" or at least pseudo-Greek character -- and this largely because the Romans wanted a "Greek" place to visit. Only the foundations and caves of Cumae have survived the centuries. 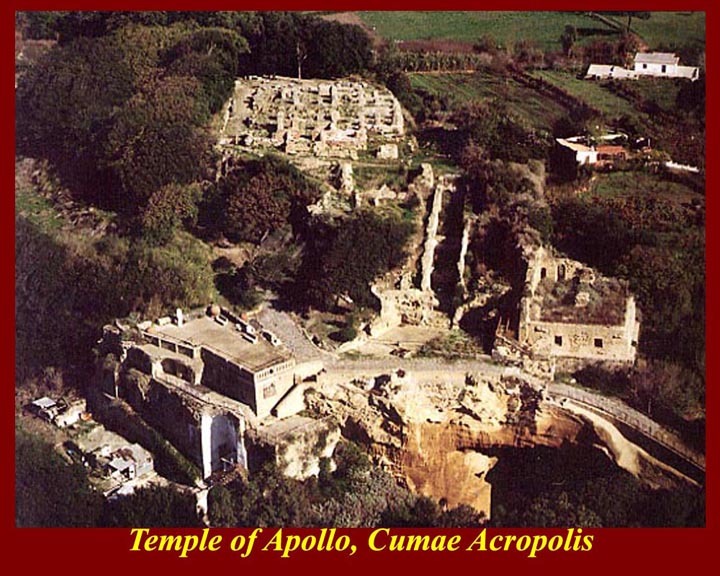 An aerial view of the Cumae acropolis and Temple of Apollo complex. The modern building at the bottom of the picture is the archeological museum. The entrance to the Sibyl's Cave and to the Grotto of Cocceius is at the very bottom right of the image. A ground-level view of part of the Apollo Temple complex. 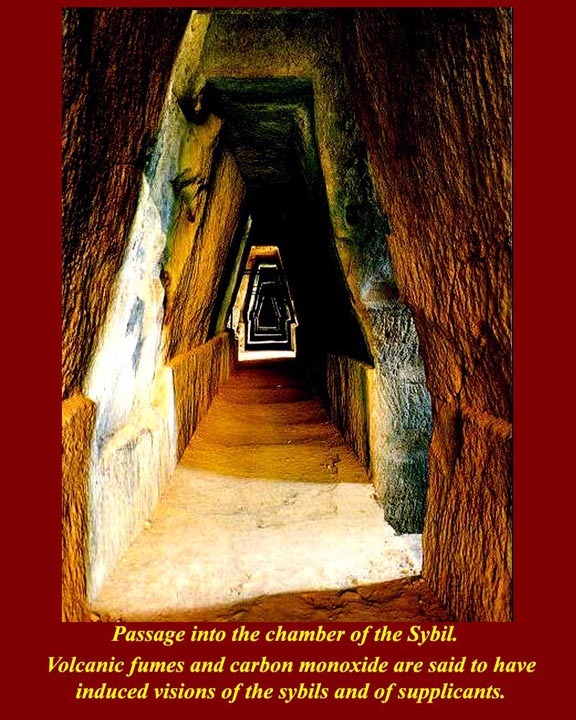 The entrance to the cave of the Sibyl is through a long hall cut through the yellow tufa. There are sunlit openings on one side and niches -- perhaps for statues or offerings -- on the interior side. The light streaming in from the side ensures that visitors were dazzled as they entered the dark inner chamber, which may originally have been a cistern or communal grain storage room. To one side of the entrance of the chamber is a niche with what appears to be a seat or throne, identified as the throne of the Sibyl. The upper image is of the inside end of the entrance tunnel and the niche of the Sibyl's throne. The chamber is now lit for the tourist trade. 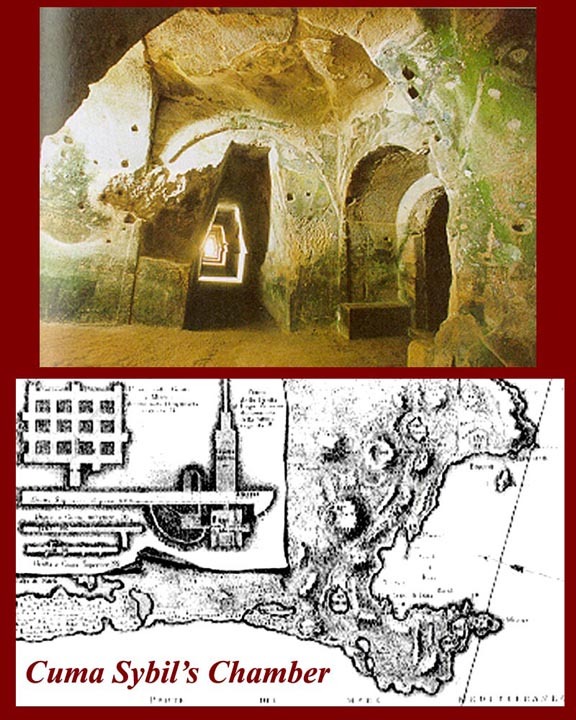 The lower image is a schematic plan of the tunnels under the acropolis including the Sibyl's cave. 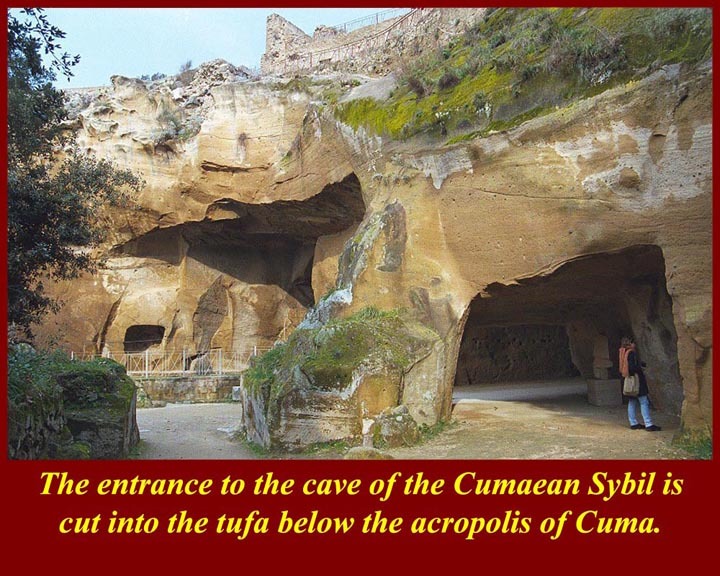 The Cumae ends of the Grotto of Cocceius and the entrance to the Sibyl's cave meet below the acropolis. Part of the ruins of the Apollo Temple Complex are at the very top of the picture. 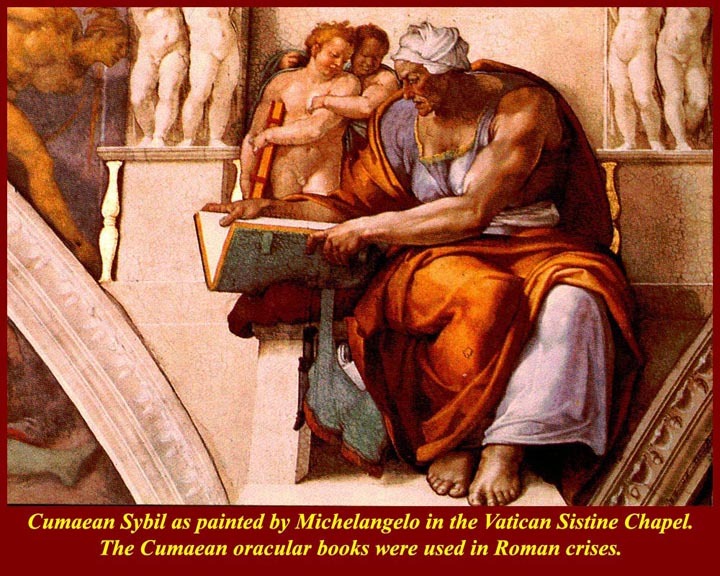 The Cumaean Sibyl that Michelangelo painted on the ceiling of the Vatican Sistine Chapel. Her robust image here belies her legend: Apollo fell in love with Daphne, the daughter of the Theban Tieresius and granted her a wish; she asked to live for as many years as there were grains in the handful of dust she had just picked up (more than a thousand); Dafne spurned Apollo's love, but the wish was still granted; but Apollo unkindly withheld eternal youth that Daphne had failed to explicitly request; and thus the Cumaean Sibyl was a wizened ancient. The ancient Romans consulted the books of Cumaean Sibylline oracles for hints on how to handle crises of state, and various Consuls, Generals, and Emperors went to Cumae to consult the old woman in the cave (Greek Ke-bele = "cave dweller") -- supposedly the same ancient prophetess that told Aeneas where to settle in Italy. 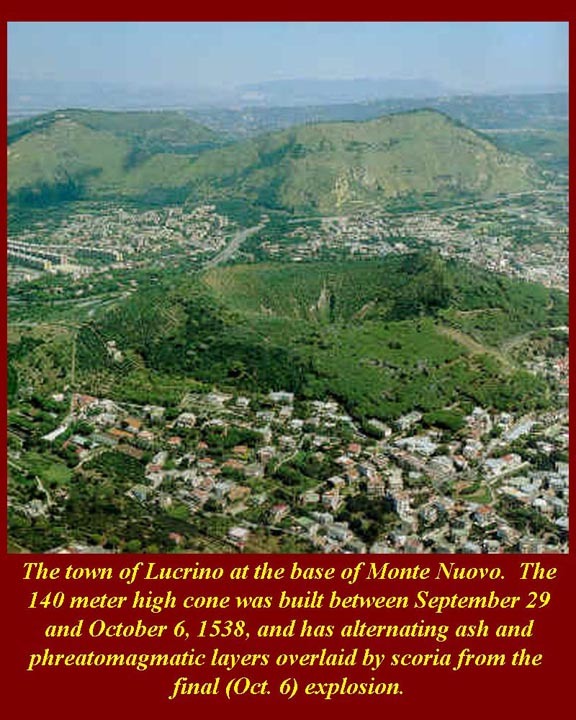 The town of Lucrino hugs the flanks of Monte Nuovo, which grew to 140 meters between September 29 and October 6, 1538. The eruption was preceded by earth tremors and rapid uplift of the site, and then the ground cracked and lava, ash and breccia spewed out. The eruption quieted after a few days and many local folks climbed the crater. A sudden explosive eruption on October 6 blew out one side of the crater killing a crowd of the curious. That was the last real eruption in the Campi Flegrei, but there have been intermittent rumblings and uplifts ever since. 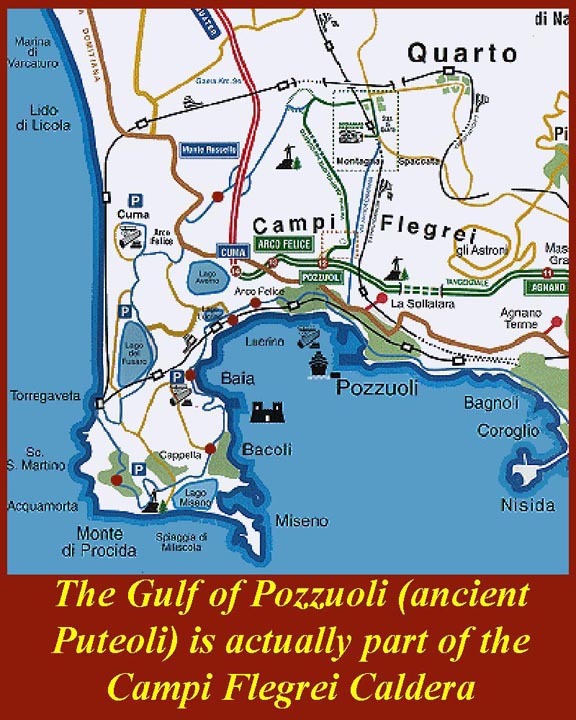 Modern Pozzuoli was evacuated in the 1970s and '80s when rapid uplifts occurred there, but nothing happened and the people eventually were allowed to return. Vulcanologists, using the most modern equipment, have estimated that a three-hundred-cubic-kilometer pool of magma lies about one kilometer below the surface of the Naples Bay caldera. The potential outlets for the pool are Vesuvius and the campi Flegrei. This sketch map shows the ancient and modern shorelines of Baiae and ancient inshore structures, the ruins of which survive. The enclosed harbor is now dry land due to uplift, but it is clear that in ancient times the shoreline outside the harbor was further out to sea. There were also structures build out into the sea in pilings outside the harbor. 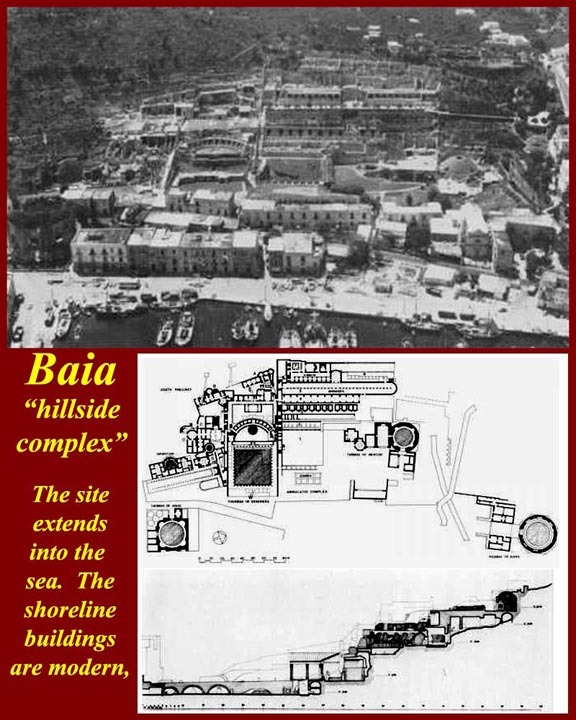 The "hillside complex" of baths and temples at Baiae (upper left in the preceding picture. A fine statue of Odysseus retrieved from the Nymphaeum in the submerged Palace of Claudius off the coast of Baiae. 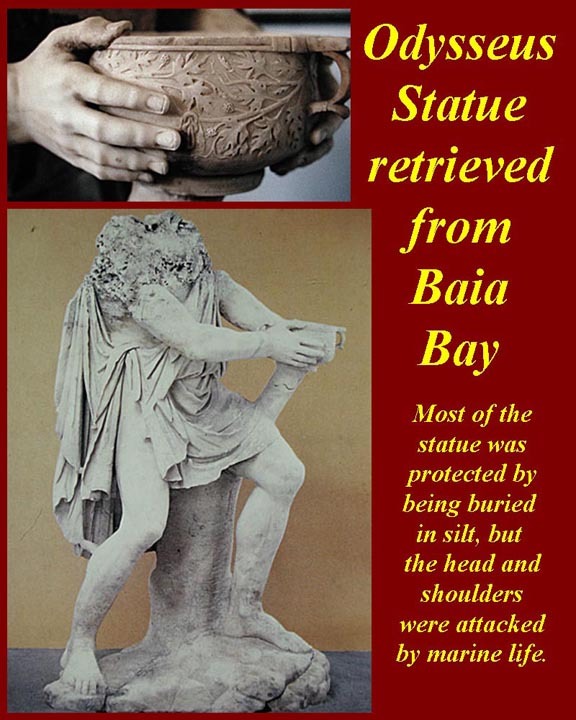 The statue was buried in sediment from the shoulders down, and the head and neck, which were not protected by the sediment were eaten away by boring mussels. The preserved parts of the statue, like the bowl held by Odysseus, are extremely well preserved. 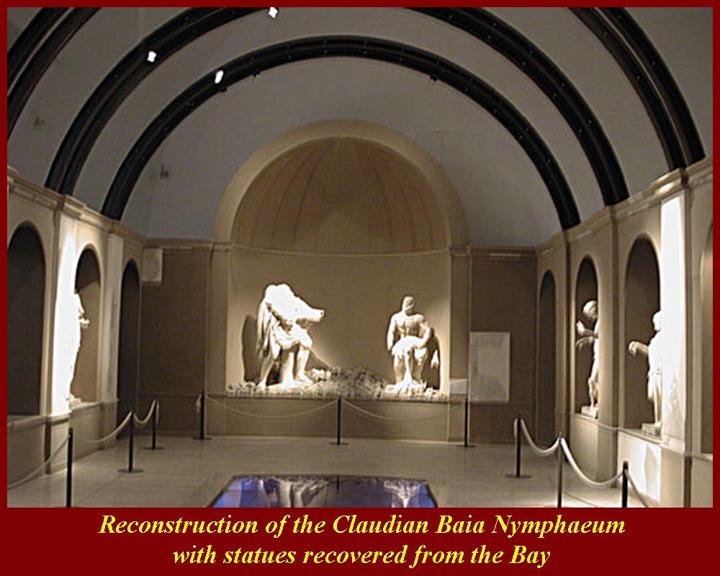 The Claudian Nymphaeum at Punto d'Epitaffio (Baiae) has been reconstructed and recovered statues emplaced at the Baiae Archeological Museum. 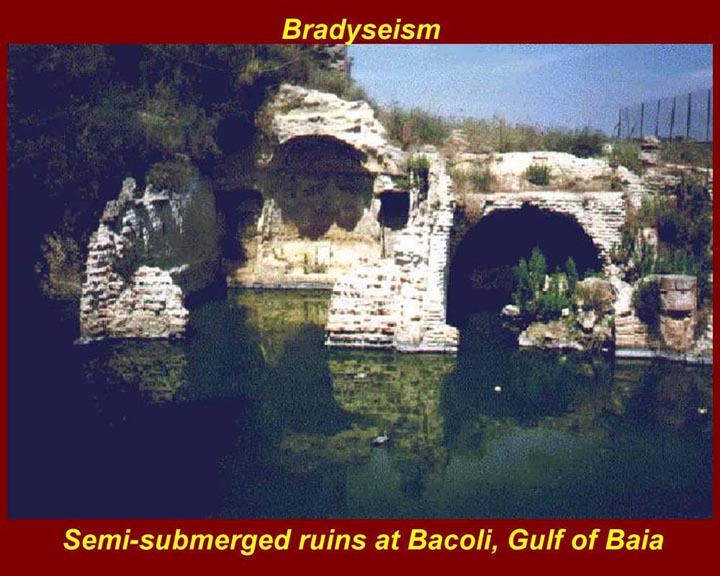 The Claudian Palace complex and the outer harbor of ancient Baiae (Portus Julius) are now submerged due to bradyseism (Greek = slow movement of the earth surface). Part of the area is now an underwater archeological park which is open to guided amateur divers. 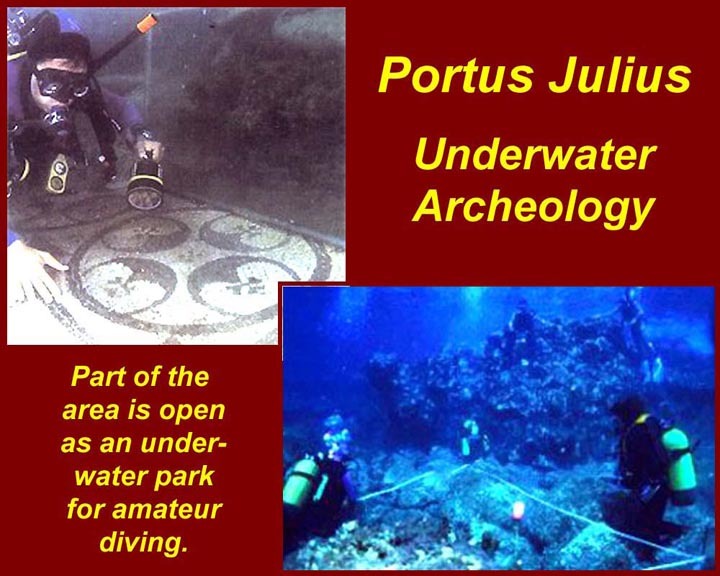 Underwater archeologists at work in the Claudius Palace complex and a Portus Julius. Semi-submerged ruins of baths at Bacoli, Baia Bay. There were dozens of baths along the coast fed by hydrothermal springs. Some are still in use -- all are horribly sulfurous. A photo taken by shuttle astronauts shows the entire bay of naples and the Campi Flegrei volcanic field. 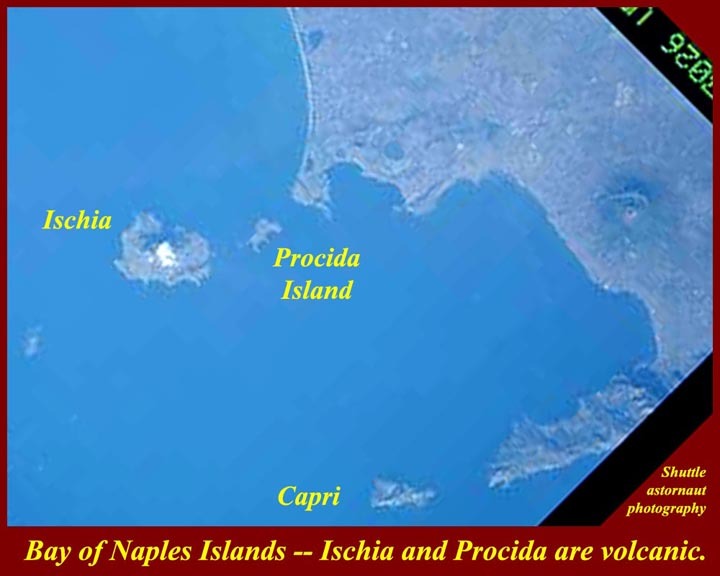 Ischia and Procida Island (and Procida's little sister, Vivara) are volcanic, but Capri at the southern end of the Bay of Naples is part of the pre-existing mountain ridge that bounds the southern end of the Naples bay Caldera. The distance between Capo Miseno and Punto Campanella (at the tip of the southern peninsula is 20 miles. Campanian ignimbrite has been found on the southern slopes of Mt. Lattari, the 1000 meter ridge of the southern peninsula. That means the pyroclastic flow of the Campanian ignimbrite eruption traveled 20 miles over water and still had enough force to push up and over the ridge. Nothing alive in the Bay or on land around the Bay could have survived the explosion and the superheated flow.